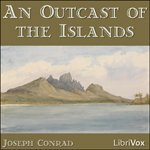 An Outcast of the Islands is the second novel by Joseph Conrad, published in 1896, inspired by Conrad’s experience as mate of a steamer, the Vigar. The novel details the undoing of Peter Willems, a disreputable, immoral man who, on the run from a scandal in Makassar, finds refuge in a hidden native village, only to betray his benefactors over lust for the tribal chief’s daughter. The story features Conrad’s recurring character Tom Lingard, who also appears in Almayer’s Folly (1895) and The Rescue (1920), in addition to sharing other characters with those novels. This novel was adapted for the screen in 1952 by director Carol Reed, featuring Trevor Howard as Willems, Ralph Richardson as Lingard, Robert Morley, and Wendy Hiller.